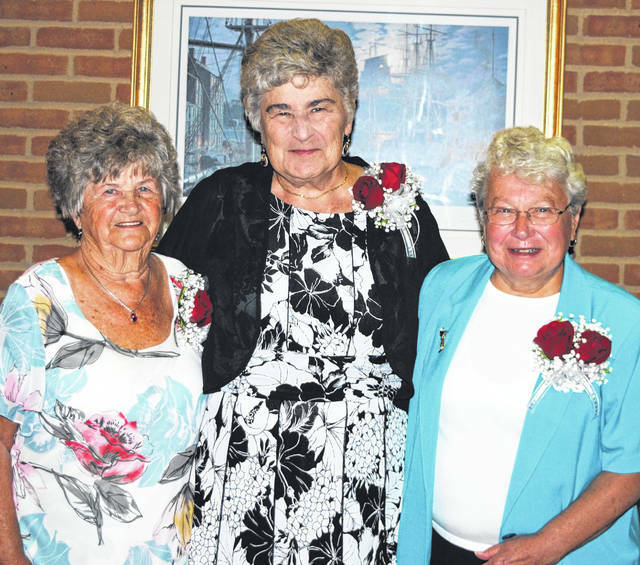 These three women joined the ranks of 110 others in the Highland County Women’s Hall of Fame during a ceremony held Tuesday evening at Southern State Community College in Hillsboro. From left, they are Luise Curtis, Nancy Baldwin and Rosemary Ryan. Three Highland County women now have their names enshrined with 110 others following Tuesday night’s induction ceremony for the Highland County Women’s Hall of Fame held at the Southern State Community College Central Campus in Hillsboro. Nancy Baldwin, Luise Curtis and Rosemary Ryan were honored for their community service, business, education and public affairs efforts over the years. The ceremony followed welcoming remarks by Karyn Evans, the dean of the college’s Adult Opportunity Center. An invocation was given by pastor Patty Burns, followed by a dinner honoring the three women. One of four women who joined their ranks in 2012, Sue Smith, opened the ceremony by reading the names of previous Hall of Fame members dating back to 1981. Virginia Purdy, from the class of 2010, introduced each of the women to the more than 100 people in attendance. A business woman and former broadcaster, Purdy shared with the crowd a brief background of the ladies and their accomplishments in selfless community service. All three women thanked those in attendance for the recognition, acknowledged their families and fellow members, and shared comments and stories from their lives. Nominations are in the process of being taken for the 2019 Women’s Hall of Fame. The two-page application form was available at the end of the ceremony. The Times-Gazette previously published feature stories on each of the three inductees. Tim Colliver can be reached at tcolliver@aimmediamidwest.com. https://www.timesgazette.com/wp-content/uploads/sites/33/2018/08/web1_Hall-of-Fame-pic.jpgThese three women joined the ranks of 110 others in the Highland County Women’s Hall of Fame during a ceremony held Tuesday evening at Southern State Community College in Hillsboro. From left, they are Luise Curtis, Nancy Baldwin and Rosemary Ryan.